A Gatling Gun is a fixed weapon that discharges rounds in rapid succession. It can be mounted on a small ship, and fired either by piloting and using it via action bar or manually inside the control panel. It occupies a 4x1x1 space. 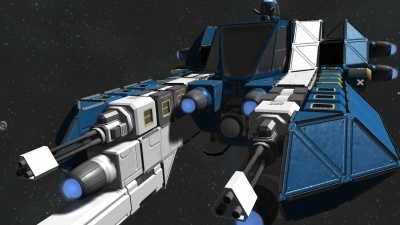 In Creative Mode it has infinite ammo, but in Survival it must be loaded with 25x184mm Ammo Containers via one of the two access points on the sides. It can hold 4 full ammo containers, which is enough for approximately 10-12 seconds of continuous firing. The gatling gun has some kick to it. 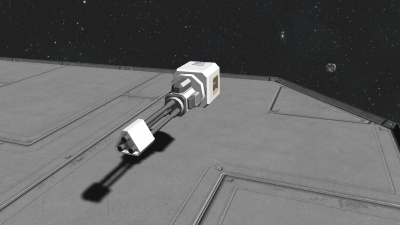 If you place a large amount of them on your ship, you will be propelled back by the recoil. By themselves, gatling guns aren't very threatening. If you fire a lot of them in a massive burst however, they can shred everything but heavy armor within a few seconds. Mass amounts of gatling guns can cause a lot of lag, so be careful how many you place! Caution: on dedicated servers do NOT fire this gun while moving forward. The bullets will spawn behind the gun and damage any components in the way. It's best to extend these guns on pylons away from you ship to avoid shooting yourself. This page was last modified on 18 March 2017, at 23:44.